.. > Print Labels > How to define a new label type? How to define a new label type? 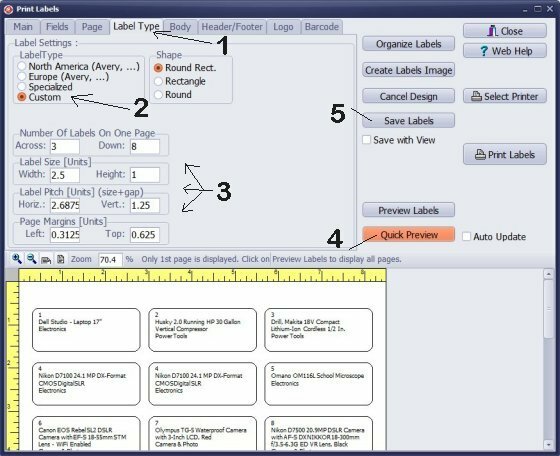 The printing label feature in Handy Library provides many ready to use label templates for Avery or Demco products (over 60 label templates are predefined). There are label templates for North America (letter paper size) and Europe (A4 paper size). You can use labels that are not in the list of predefined labels. To create a new label template is very simple. Measure your labels and margins and enter the measurements in the template setup boxes. Count how many labels Across. Count how many labels Down. Measure the label Horizontal Pitch (Width + H. Gap). Measure the label Vertical Pitch (Height + V. Gap). Measure page margins (Left and Top). Open the Print Labels window. Click the Label Type (1) tab. 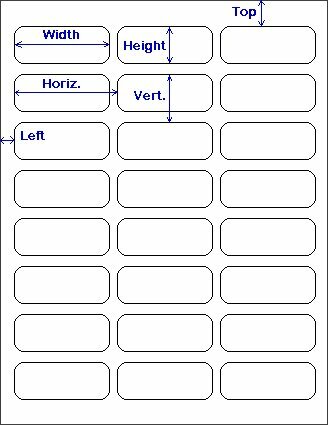 Type the measurements in the template boxes (3) (Across, Down, Width, Height ...). Click Quick Preview (4) to verify the setting. Click Save Labels (5) to save the customized label template for future use. Are your labels on A4 paper size? Review how to set the sheet size. Will your spine label software work on any other companies spine labels. Does the page of labels have to be landscape and be 30 to a page with 10 across and 3 down and of a certain width and height? You can create label template or maybe you can find predefined template already listed in the software. I have an entire package of Avery 8871 labels (business card size) on hand that I do not need, and I want to donate it to the library to use for borrower ID cards. (We will keep these cards in our office, since our borrowers and librarians are never present at the same time. Our library is self-serve; they just leave us the pocket card to let us know they have taken a book. But keeping the ID cards on hand will allow us to use the barcode reader for check-out and check-in.) Can I modify one of the existing ID card templates for use with Avery 8871? Or do I need to download the template from the Avery website and install it in Handy? Is there a Help page showing how to do either of these? Please review instructions that are listed on this page. You can also review our Avery cross reference table, or you can try template Avery 5371 10, Business, ID Cards (already listed in our library software). I am using spine labels Demco 98 in landscape, so it is 14 labels across and 7 down. I had previously designed this in Small Library Organizer Pro, called demco small 1 but this does not seem to have been carried over to Handy Library Manager. I have tried to design the spine label in Handy Library, but cannot make it work, and cannot find any appropriate instructions on the web help - please can you send me guidance on this? Review our step by step guide on how to create a custom label template.